Tony McCreath posted on Google+ that he received an email from Google My Business with statistics and analytics on how well his Google My Business listings are doing in Google Maps and Local. I believe Google sent this out in the past, maybe not through Google My Business, but through Google Places and the other names it had. But I wanted to share with you the screen shot from Tony. 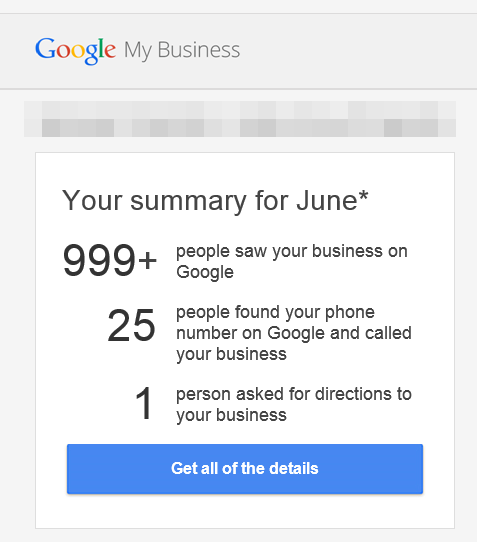 The email shows a monthly recap of the number of people on Google who saw your business. The number of people who called you via Google My Business and the number of people who requested directions. of course, it also links to more analytics and data, but the email teaser just has that data.